LUCKNOW: The roar of the tiger is getting louder at the Dudhwa Tiger Reserve, with the recent census revealing a rise in tiger population by eight to 10 % in its core area. The last census, held in 2010, had indicated about 80 tigers in the core area of the reserve — which includes the Kishenpur Wildlife Sanctuary and parts of the Dudhwa National Park. As many as 112 tigers were counted last time in the entire range that included Katarniaghat, Kishenpur, Pilibhit, North and South Kheri along with the core area of Dudhwa. At present, data collected from the Dudhwa Tiger Reserve’s core area has shown a rise and census officials indicate that the final count would be larger. As many as 382 photographs have been downloaded from the cameras which were installed in Kishenpur sanctuary and Dudhwa National Park. “Each photograph is being studied by scientists to decipher one tiger from the other on the basis of the pattern of their stripes,” said deputy director of Dudhwa Tiger Reserve VK Singh. The preliminary findings of the data collection done under first phase of tiger census conducted by the National Tiger Conservation Authority ( NTCA), all over the country, have come for Dudhwa and Kishenpur. At other places, the exercise is still underway. Camera trapping is on in three tiger-dominant ranges of Pilibhit and partially in North Kheri. In South Kheri, it might begin post-monsoon. To come up with an extensive information on felines in Dudhwa, tiger census is two-pronged exercise for UP this time. 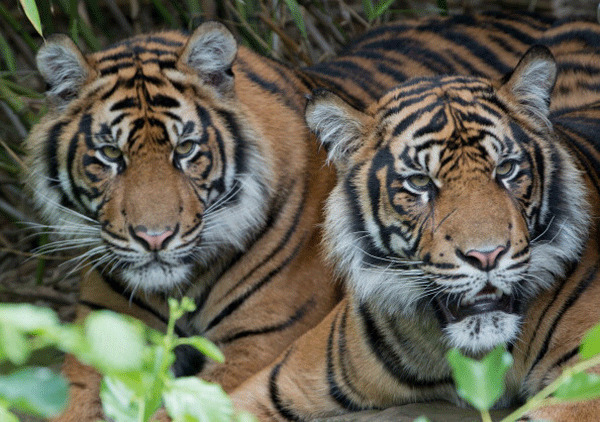 It will not only count tigers but also do a detailed research on big cats, their habitat and prey in the reserve. The cameras are installed at spots where maximum population of herbivores has been sighted like grasslands and water bodies because that is where tigers can be clicked more frequently. To make camera-trapping more intense, a pair was installed per 1.6 sq km in Dudhwa and Kishenpur. At other places also, maximum number of cameras would be installed. The final figure would be sent to the National Tiger Conservation Authority, which is conducting the exercise all over the country.